Earn $5.49 in VIP credit (549 points)What's This? 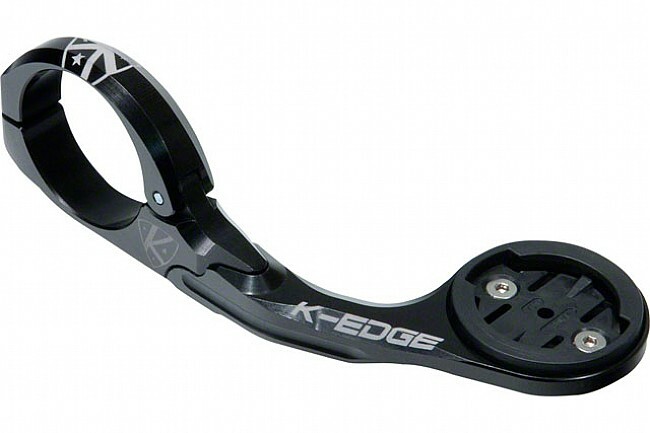 K-Edge's 35 mm Garmin XL Mount is designed to fit larger EDGE model computers such as the EDGE 1000, 810, and 800 onto 35 mm diameter handlebars. It's also compatible with any smaller models like 500-series EDGE computers. CNC'd 6061 T6 Aluminum construction is lightweight and strong, and a hinged clamp mechanism makes installation easy. The replaceable locking mechanism is secure and reliable thanks to an extensively tested copolymer insert that's designed to breakaway in case of a crash instead of damaging the mounting points on the computer body. Available in multiple colors. Made in USA. Compatible with oversize 35 mm MTB handlebars only. Claimed weight is 61 g.
Perfect mount for my 35mm bars with ideal distance for the Garmin 820 computer. Like - fits a 35mm handlebar, sufficient length to fit any size computer, sturdy construction not plastic. A guide to selecting cycling computers.